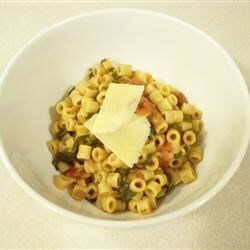 "Hearty pasta and lentil dish. Sure to warm you down to your toes! Serve with Parmesan and crusty bread." Brown onion and garlic in oil over medium heat. Stir in lentil soup and tomatoes. Bring to boil. Stir in spinach and spices. Simmer. Meanwhile, cook pasta in a large pot of boiling salted water until almost done. Drain. Mix pasta into lentil sauce. Cover, and keep warm for 20 minutes. Serve with Parmesan cheese. This was good in a pinch.